This 6-oz. popcorn machine features a stainless steel kettle for fast warm up and consecutive three-minute popping cycles. It also has a heavy-duty kettle drive motor, tempered glass, and a strip heater corn freshener under the deck of the popper. 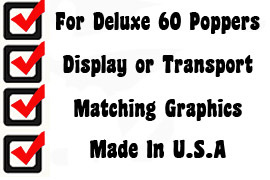 Great pricing! The bright red lit popcorn cabinet will keep'em coming back for more. 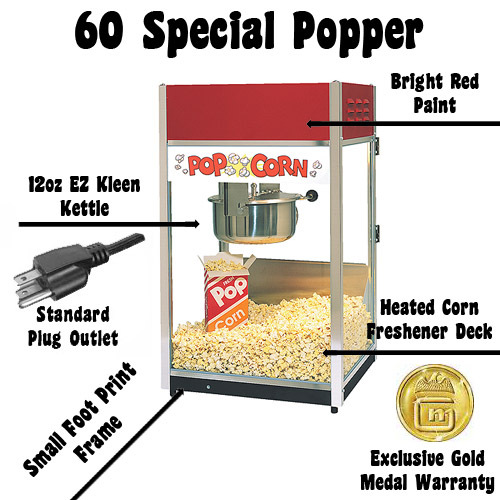 Gold Medals 60 Special Popcorn Machine. 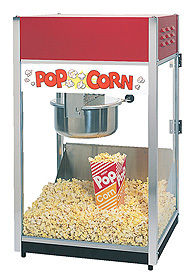 The industry's original Deluxe 6 oz kettle popcorn popper. Silver top and bottom frame, bright aluminum finish, tempered glass, with EZ Kleen kettle. Heavy-duty reinforced top dome and side vents allow for displays on top. What a perfect match! 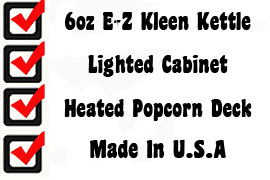 It's a great time to think about adding the Gold Medal 2669 Red Ultra 60 popcorn cart. It's a great way to show off the machine. It has welded legs, adjustable feet and super cool graphics. Large rear tires make it simple to move the cart from room to room.